VIDEO - Israel has managed to sabotage another vessel seeking to reach the Strip, this time in Turkey, one of the organizers of an international aid flotilla to the blockaded Strip said Wednesday night. Talking to Ynet, he blamed Israel for "causing damage" to Irish ship 'Saoirse' (Gaelic for freedom), which was slated to carry some 20 activists. The man said he had spoken to the ship's crew while it was docking in Turkey, and they had no doubt the damage was intentional. "It was an intentional sabotage, no doubt. 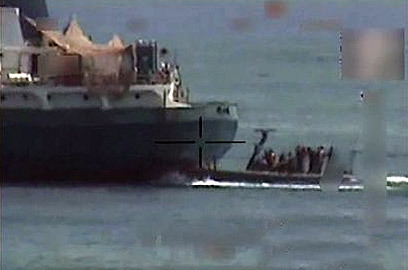 The Irish removed the ship from the water, and this act of sabotage was intended to deactivate the ship. The activists took photos of the damage, and the pictures will be presented Thursday in a press conference in Dublin." The flotilla's organizers have been trying to maintain secrecy so far, and have only agreed to say that the ship was docking in one of the Mediterranean ports. Nonetheless, the activist expressed his confidence that Israel was responsible for the damage. "We know that Israel is a sophisticated enough country, and as much as we have tried to maintain secrecy, we knew it had more sources than we. It's clear who had an interest to harm the ship." He added that "there were guards on the ship, but with diving equipment and skills it's hard to detect someone coming from under the water." Reports on malfunctions and delays have been growing in the past few days, as the flotilla prepares to set sail. An internal document obtained by Ynet reveals that fewer than 300 activists will be taking part in the protest activities against the Gaza blockade – a significantly lower number than initially expected. Meanwhile, state officials have expressed their satisfaction over the developments. The Foreign Ministry, Prime Minister Benjamin Netanyahu and Defense Minister Ehud Barak are continuing their talks with European leaders and American senators in a bid to have the entire flotilla canceled. According to information obtained by Israel, due to the delays the flotilla will set sail on Sunday, rather than on Saturday as planned. "We're continuing to exert pressure, so that the flotilla won't set sail at all. Israel prefers not to see the flotilla arrive in the region, but if it does – it will face the IDF. We won't let them enter Gaza in any way," a state official said as the defense establishment completed its preparations for a possible operation. The malfunctions in some of the vessels and the smaller number of passengers have created a situation in which the only ones left are the most radical activists, which will be tougher to handle by the IDF. Earlier Wednesday, Irish Prime Minister Enda Kenny called on Israel to avoid actions that could harm people sailing with international aid flotilla that plans to challenge a naval blockade of Gaza. "I would call upon the Israeli government not to take any action that would in any way cause injury or harm (to those on the flotilla)," Kenny told the lower house of parliament. See all talkbacks "Activists: Israel sabotaged Irish vessel too"